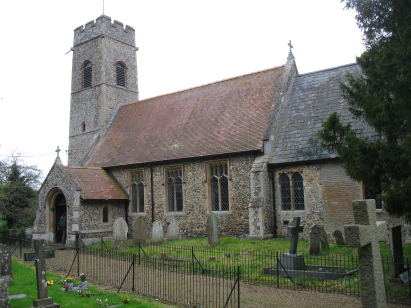 The parish of Rockland St Mary sits in eastern Norfolk about 7 miles south-east of the city of Norwich and in the valley of the River Yare. The village lies north of the A146 road which links Norwich to Lowestoft and is situated on the edge of the flood plain of the Yare. The village is very linear with a row of settlement stretching for almost a mile along an east-west leading road, its feet are in the grazing marshes and its head at almost 80 feet above sea level on arable farmland. There are three parishes called Rockland in Norfolk, the other two are in western central Norfolk and over 20 miles from Rockland St Mary. St Mary's church lies on the higher ground at the western end of the village. 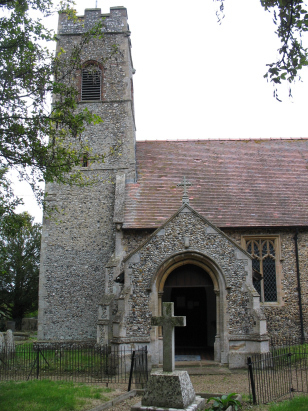 Like most Norfolk churches it dates largely from the 14th Century and was extensively restored and altered during the Victorian era. One curiosity of the church is the rather slim and delicate tower, remarkably still standing unlike many of similar design in Norfolk and thus a tribute to the builders. The church is set back behind the houses at the west end of the village and is remarkably peaceful in its setting. The register book covering the period of this transcript runs from 1813 through to 1886 and is filmed on Microfiche 4 & 5 in the collection of the Norfolk Record Office and from which this transcript was prepared. As the register book continues beyond 800 entries this is not a standard register book. The microfiche are rather elderly and suffer from the deficiencies of the period in which it was filmed. The images are poor and lack contrast being misty and in places out of focus. There were periods were it was a struggle to read the entries and the transcript carries a strong caveat as to accuracy as a consequence. Hopefully few errors will have crept in but confidence is lower than normal as a result of the quality of filming.